This article is about the Mexican soup. For the Philippine stew, see Menudo (stew). For the Puerto Rican band, see Menudo (band). For other uses, see Menudo. Menudo, or pancita ([little] gut or [little] stomach, from Spanish: Panza; "Gut/Stomach") is a traditional Mexican soup, made with beef stomach (tripe) in broth with a red chili pepper base. Usually, lime, chopped onions, and chopped cilantro are added, as well as crushed oregano and crushed red chili peppers. Menudo is usually eaten with corn tortillas or other breads, such as bolillo. It is often chilled and reheated, which results in a more concentrated flavor. The popularity of menudo in Mexico is such that Mexico is a major export market for stomach tripe from US and Canadian beef producers. Menudo is traditionally a family food prepared by the entire family, and even serves as an occasion for social interactions such as after wedding receptions where the families of the groom and bride go to either family's house to enjoy an early morning bowl of Menudo. In popular Mexican culture, Menudo is believed to be a remedy for hangover. Since menudo is time and labor-intensive to prepare as the tripe takes hours to cook (or else it is extremely tough), and includes many ingredients and side dishes (such as salsa), the dish is often prepared communally and eaten at a feast. Documents from the Works Progress Administration indicate that in the 1930s, among migrant workers in Arizona, menudo parties were held regularly to celebrate births, Christmas, and other occasions. Menudo is time intensive, taking four to seven hours to make. The meat should first be rinsed clean. Menudo usually has tripe, honeycomb and "librillo" beef meat along with the beef feet and tendons. Pigs feet is also used in northern style menudo for example Chihuahua. The feet and tendons are boiled first at low to medium heat for about three hours. Skimming off the top layer of floating foam about every 15 minutes for the first hour helps the flavor. After the first three hours, the tripe should be added along with salt, an onion cut in half, and one or two heads of garlic. Red menudo has the addition of Guajillo chili paste. The menudo is allowed to continue boiling for an additional three hours while covered. Once it is almost done, the hominy is added. There are a number of regional variations on menudo. In northern Mexico, typically hominy is added. In northwest states such as Sinaloa and Sonora usually only the blanco, or white, variation is seen; menudo blanco is the same dish, with the difference that red pepper is not added (though jalapeño may be added to the broth to replace the spice found in the red version), thus giving the broth a clear or white color. Adding patas (beef or pigs feet) to the stew is popular in the U.S. but not universal. In some areas of central Mexico, "menudo" refers to a stew of sheep stomach, "pancitas" stew of beef tongue. 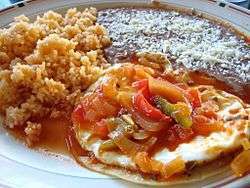 In South-Western Mexico (in and around the Distrito Federal, Morelos, and Guerrero) it is called "panza" or "panza guisada". The red variation is usually seen in Chihuahua, the northern state adjoining Texas. It is also usual to use only yellow hominy in menudo in the Texas region. A similar stew made with more easily cooked meat is pozole. 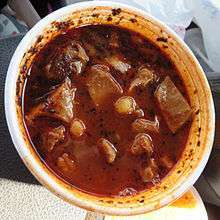 In the United States, since the mid-20th century, prepared menudo has been common in food stores and restaurants in cosmopolitan areas and in other areas with a significant Mexican population. Restaurants often feature it as a special on Saturday and Sunday, and the folklore belief that menudo will alleviate some of the symptoms of a hangover is widely held. An annual Menudo Festival is held in Santa Maria, California. In 2009, more than 2,000 people attended and 13 restaurants competed for prizes in three categories. The festival is organized by the National Latino Peace Officers Association of Northern Santa Barbara County and the money raised goes toward scholarships for local students. ↑ Arellano, Gustavo (2007). Ask a Mexican!. mex: Simon and Schuster. pp. 148–49. ISBN 978-1-4165-4002-1. ↑ Kurlansky, Mark (2009). The food of a younger land: a portrait of American food; Before the national highway system, before chain restaurants, and before frozen food, when the nation's food was seasonal, regional, and traditional: from the lost WPA files. mexששמםיה: Penguin. pp. 353–56. ISBN 978-1-59448-865-8. ↑ "Where do you go for Menudo on Sunday in LA?". Chowhound. Retrieved 24 May 2015. ↑ Gonzalez, Ray (1992). "Hangover Cure". Lapham's Quarterly. Retrieved 2013-05-05. ↑ Staff report. 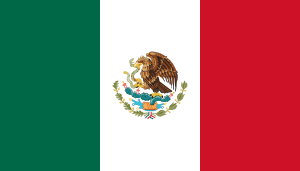 "Annual festival celebrates Mexican Independence Day". Santa Maria Times. Retrieved 24 May 2015.